Nov. 30, 2017 9:30 p.m. The Langley Christian Lightning continue their run for a second consecutive provincial banner. 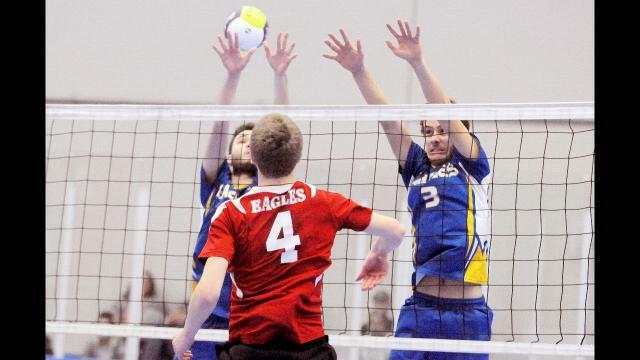 The Lightning — the Fraser Valley champions and defending provincial champions — dispatched the MEI Eagles 3-0 in the quarter-finals of the BC boys AA championships on Thursday at the Langley Events Centre. Langley Christian has yet to drop a set after a perfect 3-0 showing on day one to win their pool, and then consecutive 3-0 wins in the round of 16 and quarter-finals. The Lightning had beat the Smithers Gryphons in the earlier match on Thursday morning. MEI’s loss means the team has no chance at a medal, ending a long string of provincial success. The Abbotsford school had won 10 provincial titles and five bronze medals over the last 15 seasons. The Lightning face Prince George’s Duchess Park Condors, the top seed from the North Central zone, in Friday’s semifinal. The Condors beat Langley Fundamental in the round of 16 and then Richmond Christian in the quarter-finals. The other semifinal features Abby Christian and College Heights. Abby Christian defeated Smithers in the round of 16 and Prince Charles in the quarter-finals. College Heights beat WL Seaton Seaton in their first game on Thursday and then defeated George Elliott in the quarter-final round. Both semifinal games get underway at 4:45 p.m. on Friday with the gold medal game Saturday night at 7 p.m. In the boys AAA draw, the quarter-finals are set for Friday morning. The Mount Baker Wild play the Elgin Park Orcas in one match with the winner facing who ever advances between the Dover Bay Dolphins. The bottom half of the draw has the Earl Marriott Mariners set to battle the Argyle Pipers in one game and the Penticton Lakers versus the Semiahmoo Totems in the other. The semifinals will both be played at 8 p.m. on the Friday night with the gold-medal game set for Saturday at 5 p.m.